Do you have a son or daughter, a niece or neighbor or friend, who will receive Christ in the Eucharist for the first time this Spring? I still remember fondly the day of my First Holy Communion. The white dress, white patent leather shoes…. a prayer book, a new watch from my godparents, a crisp $20 bill. But while I understood that this was Jesus I was receiving for the first time, I’m not sure how much I understood what difference He would make in my life. This Missal for Children is an elegant gift, in white leather with the cover embossed in gold. It offers the Mass prayers so a young reader can follow along; but there’s so much more! Do you remember the pre-Vatican Daily Missal which had Latin on one side, and an English translation on the opposite page? This book works like that-but while the Mass Prayers are printed on the right, with illustrations depicting the posture for the children and for the priest. 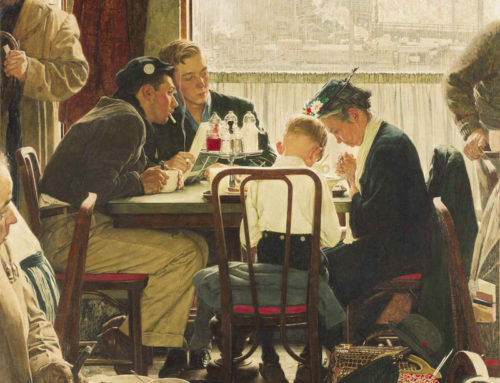 The left is reserved for an explanation of each prayer: a brief history, for example. And these features are so important: A section at the front on “The Meaning of the Mass” explains, in language children can understand, howo the Mass is a representation of Calvary. “A Guide to the Liturgy” teaches where the word “liturgy” comes from, the colors of the liturgical year, and the seasons. The other sections include a chapter on Prayers, a guide to the Sacrament of Reconciliation, a Glossary, and really neat for children, a section on Objects and Vestments for Mass. 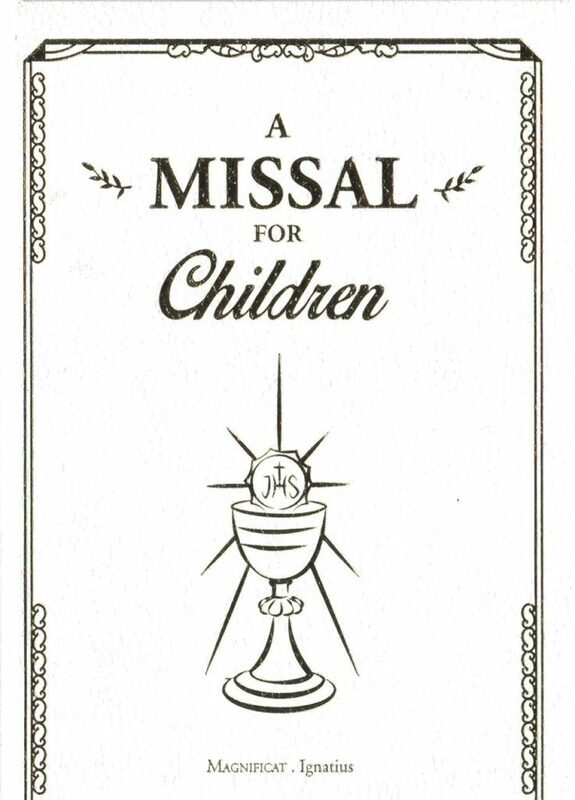 I wish I’d had A Missal for Children when I was young! 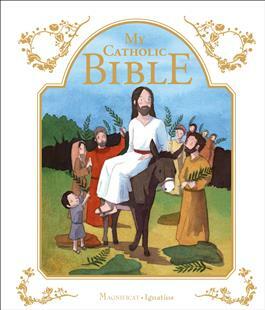 Now here is a thing of beauty and a perfect gift for the First Communicant or any child in your life. I opened My Catholic Bible to find a formal presentation page in this sturdy white children’s bible with gold leaf edging. Kudos to Emilie Vanvolsem for her colorful and simple illustrations which capture the emotion in well-known bible stories. Together, all of these stories tell the great history of the people of Israel, to whom God chose to reveal himself. 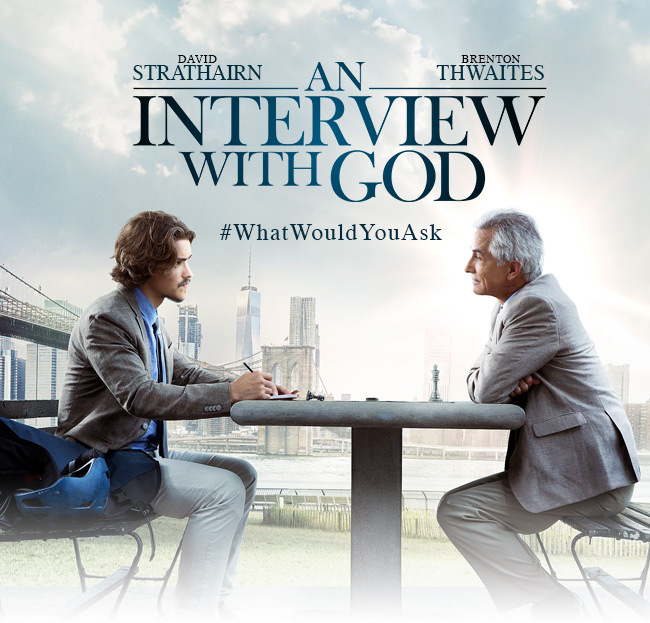 Reading the Bible helps us to answer such questions as: Who are you, God? Why do you come to speak to us? What is it you wish to give us? How can we become your friends? The men and women in the Bible were not perfect. Far from it! 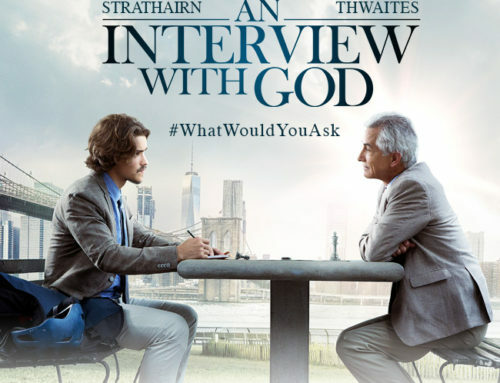 But they gradually discovered something very important that changed their lives: God was always with them, even when they made silly, and sometimes even big, mistakes. With this Bible, children can meet these friends of God on their own. Long or difficult texts are summarized or explained, and the illustrations will help them to understand the essentials…. The book explains things which you, a lifelong believer, may take for granted, but which may challenge the young reader: Who wrote the Bible? How do you look things up in the Bible? There’s a section at the end of each chapter which explains how people lived during biblical times. At the back, there’s an index of main figures and events, and a glossary with page numbers to send the curious child back to find the term in the text of Scripture. Some things just need explaining, and My Catholic Bible covers it in sidebar notes. What does “Son of Man” mean? What’s “leaven”? 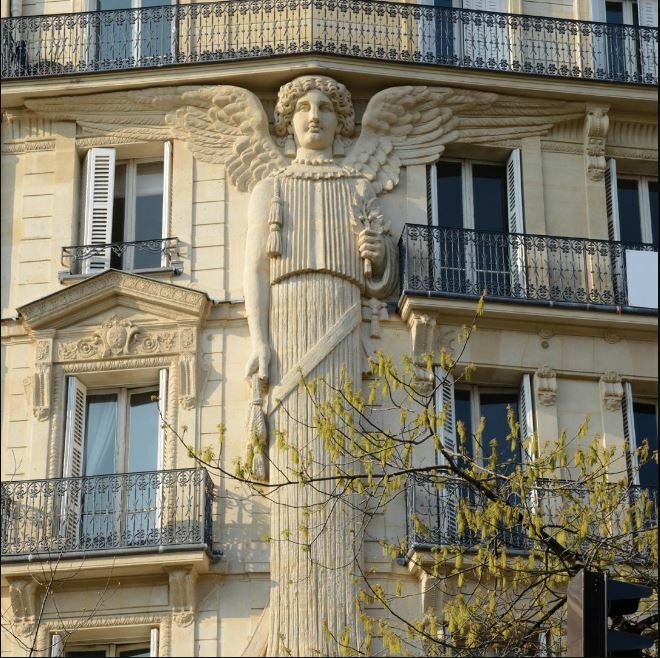 Who are the “men in white robes” at Jesus’ Ascension into heaven? I imagine children begging for bedtime stories from My Catholic Bible, or cuddling up in a corner to read it for themselves. 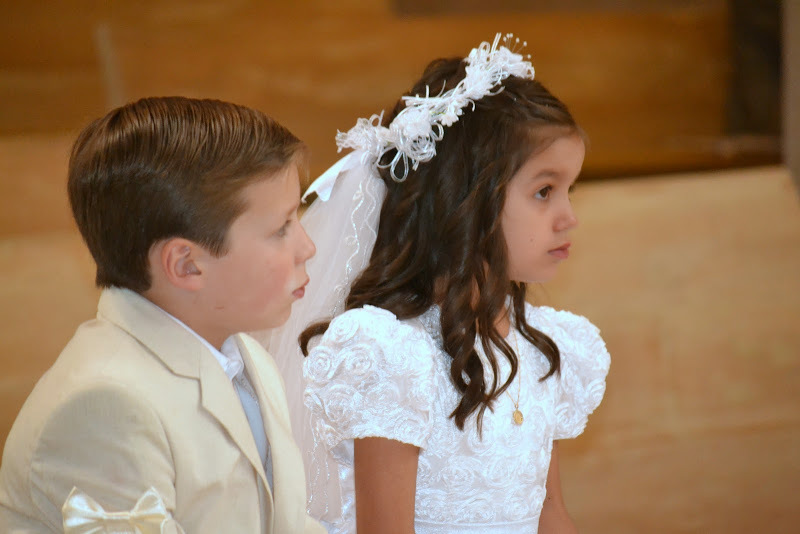 These ideas are really great first communion… but my question is, in my case and for all Catholic youth in CCD class preparing for first communion is why don’t the teachers teach them these things during the class? If only 1 out of 100 communion recipients receives a Catholic Missal (honestly a great idea for a gift) when and where will the rest of the 99 of them learn the true purpose of the mass, the liturgical seasons, and so forth? Why is this not taught to Catholic youth in the classes? Why is it always just arts and crafts? I am 19 years old and even after first communion and confirmation preparation at a Catholic parish in New York, none of these things were taught to me. It wasn’t until I was 18 years old, a very dedicated Catholic friend of mine taught me all of these beautiful Catholic truths that I was never taught… and I realized there was even a time when I received communion unworthily, not in the state of grace, and not having confessed for 5 years. I was not taught that I had to go to confession at least once a year, as stated in the Catechism of the Catholic Church. St. Padre Pio would tell his parish to go to confession ideally once a week. I started reading Vatican documents and books from saints, and realized really how deprived us Millennials and the past two generations or so have been from many inspiring and beautiful truths. Why is Catechism so watered down nowadays? My parish confirmed over 100 teenagers when I got confirmed 5 years ago. None of us ever learned about the true meaning and sacrifice of the mass. 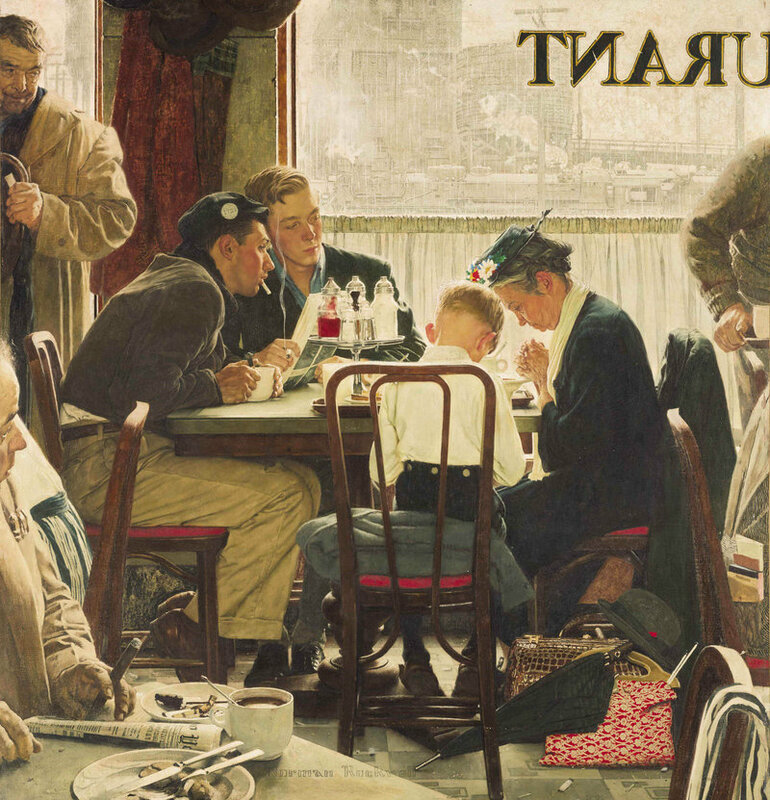 It might have been mentioned once as a comparison to the last supper. But that is not just what it is. We did not learn about the priest being in persona Christi, or about Eucharistic adoration, or about humility and chasity. Out of the more than 100 teens confirmed in my parish alongside myself, hardly any of them attend mass each Sunday. I am friends with a lot of them on facebook, and see how many think abortion is fine, defending planned parenthood and such. 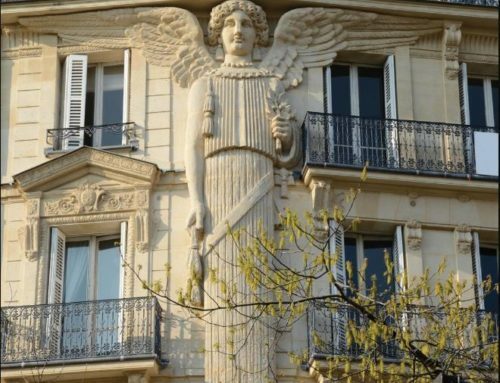 This is supposed to be the next Catholic generation, but we have not been raising them teaching Catholic truth and morals to defend their faith in today’s society, otherwise, they quickly lose it yet think they know all there is to know about it since they already received these sacraments. 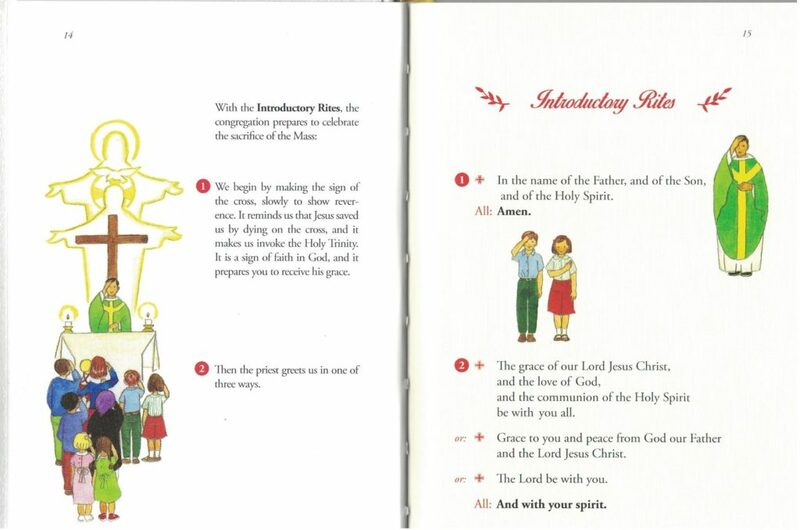 A MISSAL FOR CHILDREN should be part of every Catholic education class in preparation for the sacrament of receiving first communion. Please let’s make this happen! For the greater glory of God, for His glory in all years to come through properly educating our next generations of Catholics, who then will also be able to educate their children as obligated in the Catechism of the Catholic Church! Mary, our queen, mother of God, pray for the Catholic youth!